Founded in 1982 and headquartered in San Jose, California, Adobe Systems is the original developer of the PostScript page description language and the Portable Document Format (PDF). The company develops multimedia and creativity software and rich Internet software products and delivers cloud services such as Adobe Creative Cloud, Document Cloud, and Marketing Cloud. Adobe has more than 1,100 external domains, and many of them are key to the business—so efficient management of DNS, DHCP, and IP addresses is crucial to both the company’s reputation and its success. But five years ago, when Brent Hetherwick joined Adobe as technical lead for DNS, DHCP, and IP address management (DDI), the company was running a legacy system that caused a patching-related outage which took 24 hours to resolve. And that outage wasn’t isolated. According to Hetherwick, the product was incredibly inconsistent. “I was called in the middle of the night almost every week,” he says. It was clear that the legacy system had to be replaced with a more reliable solution. Adobe is currently running Infoblox DNS Firewall—which detects and blocks malware communications to bad domains—in logging-only mode, and it has cast light on some nasty bugs that have slipped by Adobe’s other monitoring products. Sandhu says, “It is clear that the Infoblox security solution could make DNS a contributor to Adobe’s overall security network.” He also points out that Adobe is bolstering security with Infoblox security-hardened appliances running Advanced DNS Protection, which provides defense against DNS-based attacks such as floods, reflection/amplification, NXDOMAIN, DNS hijacking, and others. Adobe also has an Amazon Web Services workload, and plans to evaluate the new Infoblox DDI for AWS integration, which increases agility and reduces expense in AWS deployments. After four years on the Infoblox gear, both Hetherwick and Sandhu see the company more as a strategic partner than as a vendor. Performance, security, and visibility are key initiatives with Adobe’s executive leadership, so the network team is continuing to extend its use of reporting, discovery, and security capabilities available with the latest Infoblox products. 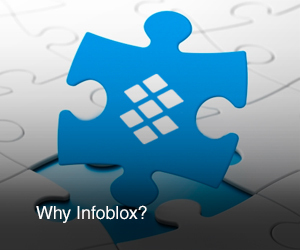 “We have a very high degree of confidence in our Infoblox DNS services,” Sandhu concludes.